I was so excited just two weeks ago to start a new design process. Then the fabrics I ordered didn't match my computer screen or the images I had in my head. I stalled out completely after redrawing the design twice. I've had theses fabrics for quite some time and all of a sudden an idea popped into my head and off I go. To top it all off, the project is for a whole different deadline and goal. A happy Thanksgiving to all of my free motion quiling peeps in the USA! If you are elsewhere, it never hurts to practice a little gratitude for all that we are blessed with every day. I know that I have found that even many of my trials work out to be something thankful for in some way. Turns out that we will be rescheduling our Thanksgiving dinner since my oldest has come down with a nasty cough and fever. Poor kid. I figured it was just a matter of time until they came down with something since we put them into public school this year, and they've been so incredibly healthy so far. I am so thankful. This also means I am not cooking turkey and several sides today, so I'm enjoying a restful day with my kids and husband. That's an extra something to be thankful for! I did however make pumpkin walnut whole wheat pancakes this morning. Yum! For the rest of you, enjoy your turkey or have a great regular day, and know that I am thankful for all of you who read this blog, comment, and share with me. Since the USA goes crazy with conspicuous consumption the day after Thanksgiving, there are a ton of sales going on over the next few days. For online shopping, you can get some great deals no matter where you live. Check out my sidebar for some specials (these are affiliate links that help support my blog). The sale I'm most interested in is Craftsy's sale on classes. They are all $19.99 through Monday! I really enjoyed my class by Kimmy Brunner,Machine Quilting with Templates: Creating Design Perfection, especially since I could combine my quilting using rulers with her method. I'm not sure which classes I'm going to buy, but Machine Quilting Beautiful Borders has caught my interest. 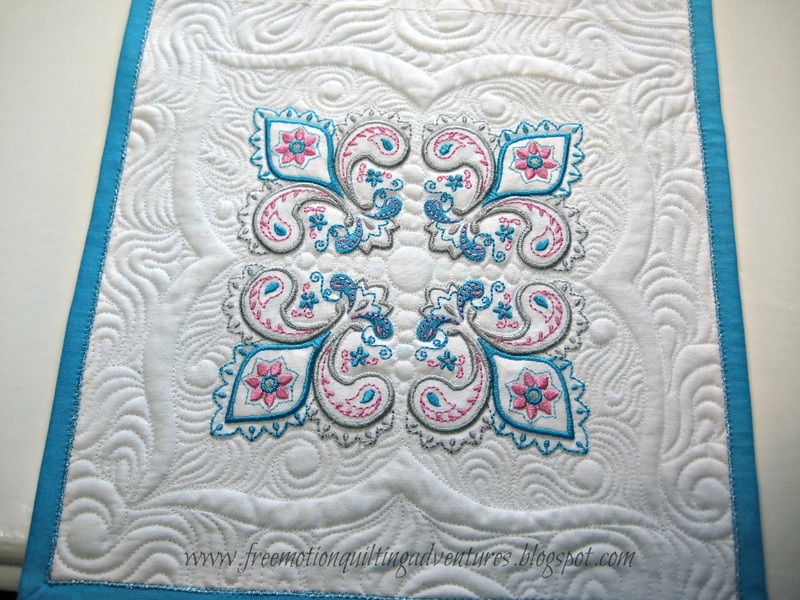 There are a ton of free motion quilting classes on Craftsy by a lot of talented quilters. 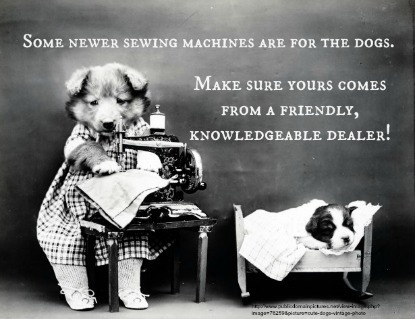 I'm looking at other classes to help me do a better job serving customers at my Janome dealer's shop. 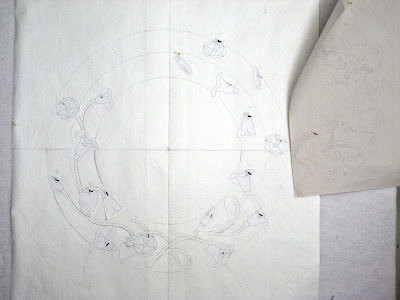 I'm taking Big Embroidery With a Small Hoop, with Lisa Shaw for sure and maybe a class on using sergers. There are also free classes there, which are especially good if you've never done one of their classes. It gives you a chance to check out their formats. They also have the QuiltCon Lecture Series 2013 for free. I also want to mention that this is the time that the big box stores and online places tend to run 50% off sales on low end sewing machines. This could be a great deal IF you are prepared to think of these machines as disposable. We get a lot of these machines in the shop and their owners are very disappointed in these cheap machines and their lack of customer support. Many times they cost more to repair than they are worth. If you or someone you know is considering one of these types of machines, remember to save your packaging and receipt so you can ship the machine back to the factory service center when you have issues. I would seriously consider who your local dealers and service persons are before choosing a machine and choose the brand or brands they carry. Once again, I am sending out my thanks to you today! 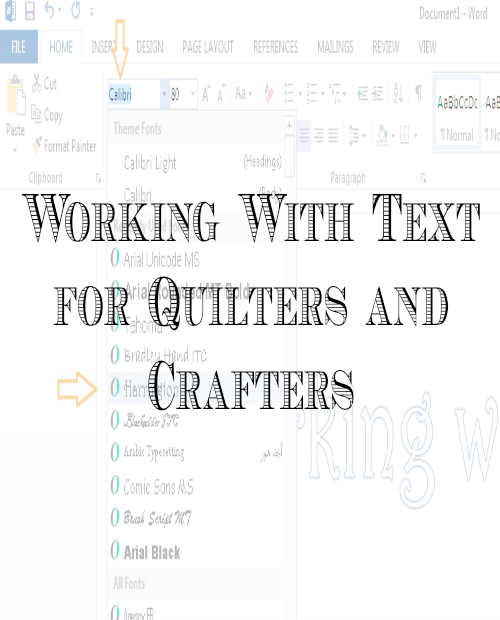 The following tutorial will show how I use Microsoft Word to make patterns for words and text that I want to use in my free motion quilting projects. This is useful for many different crafting and sewing purposes. Please do not think I'm a tech-y genius, since I still get confused by a lot of this computer stuff. Also keep in mind that when it comes to computer programs there's usually more than one way to do the same thing and there's usually variations in versions of the software. I'm sure some of you may have other ways to do this or better programs, but this is a basic tutorial with basic/commonly available programs. I am using Word 2013 which comes with my Office 365 subscription. This is the cloud-based version of MS Office. 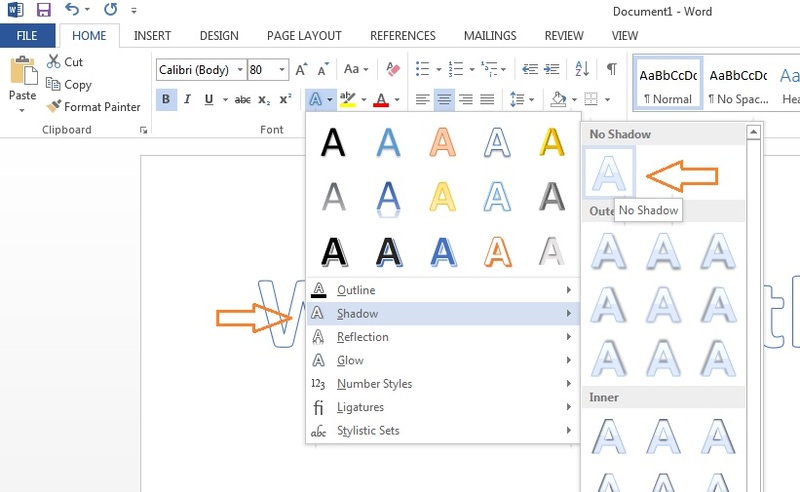 This should still be easily done in other versions of Word. Part 1 will show how to use the program to get your words to look how you want them. Part 2 will attempt to show how to print out even larger versions of this process, and I may do a final part on how to take the words from paper to fabric. First open a new Word document. Type Enter the words you want. (Can we still call it typing?) Go ahead and increase the size of the font to something easier to see (anywhere from 80-100). Don't worry about orientation, final size, or word placement at this point. 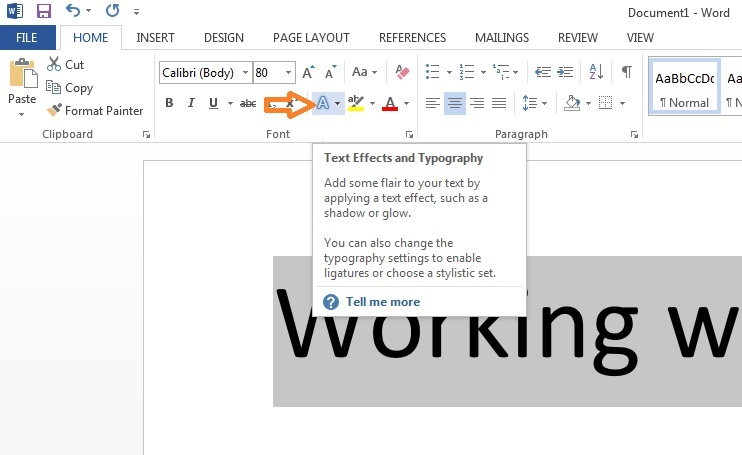 Highlight the text and click on the "Text Effects and Typography" button indicated by the orange arrow. Click the 'A' indicated by the orange arrow above. If using a different version, you're looking for something with an outline and white fill. 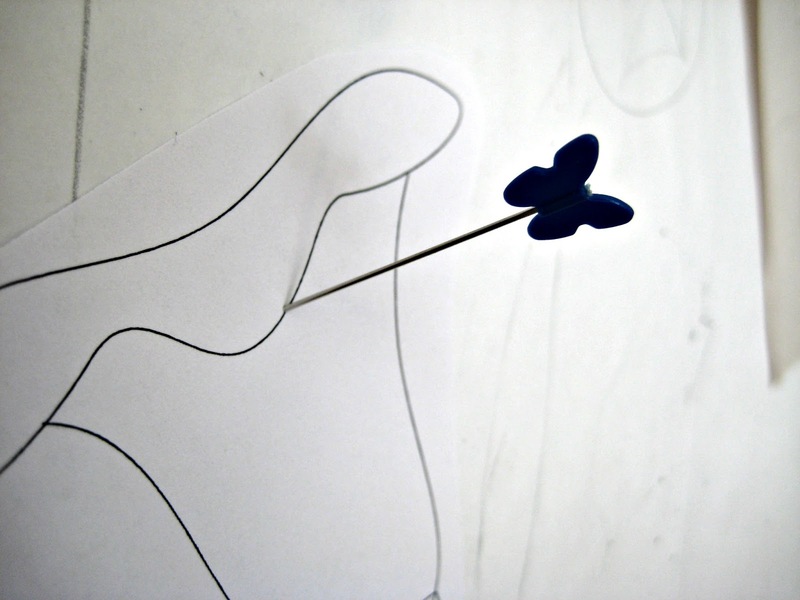 This selection will give you a blue outline. We'll change that after the next step. Since this choice will give the text a 'shadow', you want to click Shadow, then No Shadow as indicated by the arrows below. Right above the Shadow selection, it says Outline with a line of color under it. Click there to change the outline color to black for better visibility. Now it's time for the fun of trying out fonts. There's a ton, and they don't all look great when made into large letters. The orange arrows indicate how to change the font from the drop down list. I chose Harrington for this example, which is a bit too fiddly for most fabric projects. Imagine cutting out that g! Now it's time to fine tune the size and this gets less exact with my method. 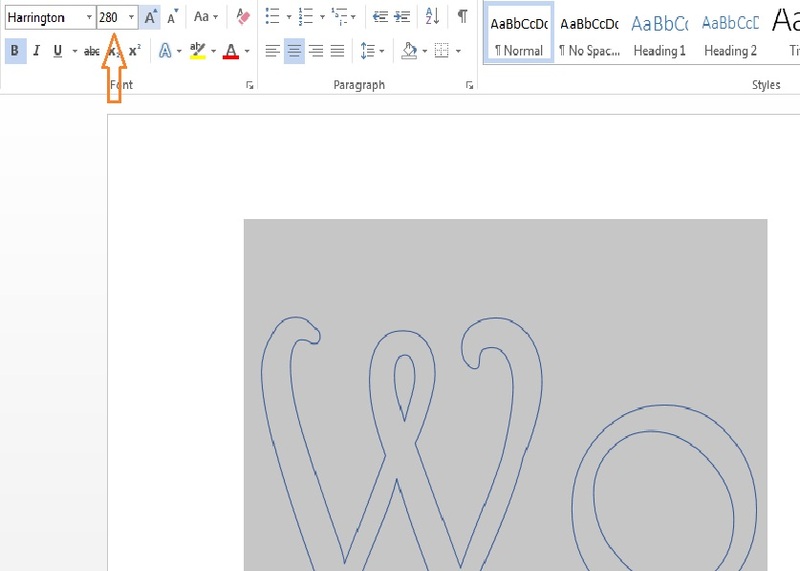 Part 2 will deal with how to print your words onto multiple pages (posterizing or tiling pages) since I haven't figured out how (or if I can) do it in Word. This will get the letters to the size you want them and in the word grouping you want. But I use different programs to do this with, hence Part 2. 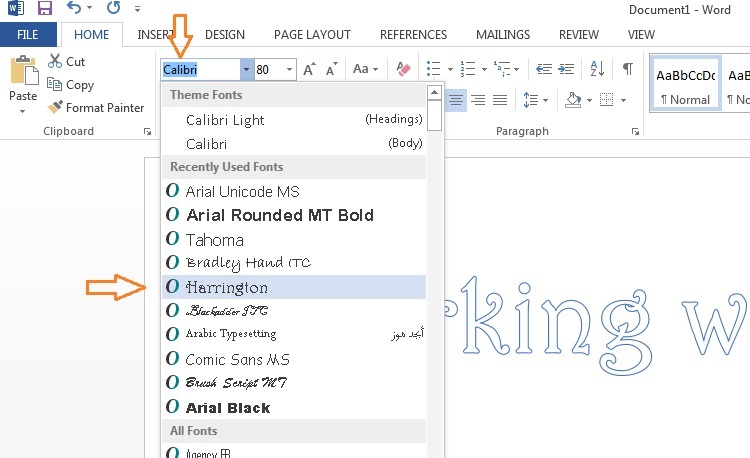 The orange arrow below shows where you can change the size of the font. You can type enter in a number or click multiple times on the A with the upwards pointing triangle just to the right to increase the size. 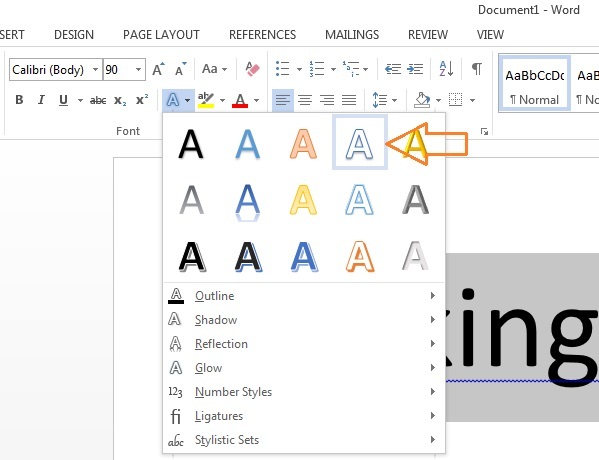 The smaller A with the downward pointing triangle will decrease the font size. Make sure you have the entire text selected by highlighting it all (click and drag). Now's the time to change the page orientation to landscape if desired (this is under the page layout tab) and to center the text on the page. If the phrase doesn't need to be very large, it may all fit on one sheet of paper and all is well. If you want it to be larger, without having to posterize (part 2), print out the phrase at a smaller size but spaced and centered/justified in the layout you want. This sheet will serve as a placement guide. Then enlarge the text (maximum size for this method is one full letter per page) to the desired size. Print the letters out and proceed with your project using the letters individually and using the smaller sized sheet of text as a placement guide. Whew! That's enough for now. 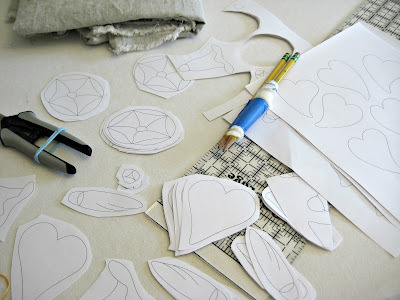 You can't imagine how many screen shots I took, how many times I re-sized them and then added arrows for this tutorial. I even had to tweak the layout of the blog so I could show enough of the screen shots at a readable size. Please ask questions in the comments below and also let me know if the blog looks good on your screens. A shop customer mentioned visiting my blog the other day and said my blog must be pretty new since there wasn't much on it. I was floored. Maybe there are compatibility issues for those using smaller devices to view the blog? I have recently bought www(dot)freemotionquiltingadventures.com and it is totally blank at this point, but she would have said it was blank if she visited there. By the way, there are some great online shopping deals to be had right now and through this week. Check my side bar for great deals. Wow! I had no idea how my article on coloring would resonate with you guys. Seems we not only have free motion quilting in common, but we just plain like to play with color. It's pretty easy to get excited about a coloring book when we can get such lovely ones like Johanna Basford's Secret Garden . I so enjoyed playing with my colored pencils. I started off with plain Prismacolor pencils but needed more colors so I got out my Derwent Inktense pencils. The post card paper was sturdy enough to hold up to a little bit of water, so I was able to play with the watercolor effects of the Inktense pencils. These pencils are nice and soft to color with, but aren't anything special when used like a regular pencil. In fact some of the colors are a bit dull and faded. But once you add a smidge of water, they get intense! Here, the addition of water allowed me to 'pull' color into the uncolored areas. It's a lot like those paint with water books for kids. You can even use these pencils to great effect on fabric with a little textile medium to wet and 'fix' the color. I know some folks use them with just water and say they are color fast once dry/heat set, but I haven't used them that way yet. Since you use the textile medium instead of water, you can color/paint on a quilted quilt without fear of the color bleeding through to the back. This is a project from 2011, where I quilted first with black thread to make the design, then I filled the background with white before finally coloring. The bird has a bit of junk in the trunk, don't you think? Playing with coloured pencils like a child, sketching, colouring, dreaming of quilts to be made. Heavenly! Thanks to everyone who commented. I have more of these Postcards , so we'll do this again in the future. Nope, not that kind of patchwork. Just a little bit of this and that for you today. Forgive me in advance for rambling on and writing a total hodge-podge. I've got a ton of stuff in the works but nothing actually done other than what I shared with you on Wednesday. Designing a show quilt- I'm revamping the design after stalling out when I had to change up the fabrics. I'm almost back to nothing. Suffice it to say, I won't be submitting a quilt to anything soon. What was I thinking? Re-organizing my "studio". Done for the most part. A little clutter to clear away then I'll share my new arrangement. My cutting table, where I sit or stand when at my computer, now faces a window. I've been watching a wren on my porch off and on all day. Checking out the new Janome S5. We've got them at the shop and I'm working on a review of it. Preliminary investigation tells me I like it. I won't trade my 6600 in on it, but if I were just now looking for an upgrade from a typical sewing machine, this would be the one. It has nearly the same harpspace/throat (1/2 inch less, I think) than my 6600, but nearly 3 inches more than most basic sewing machines. Plus a ton of high-end features while retaining a mid-range price. 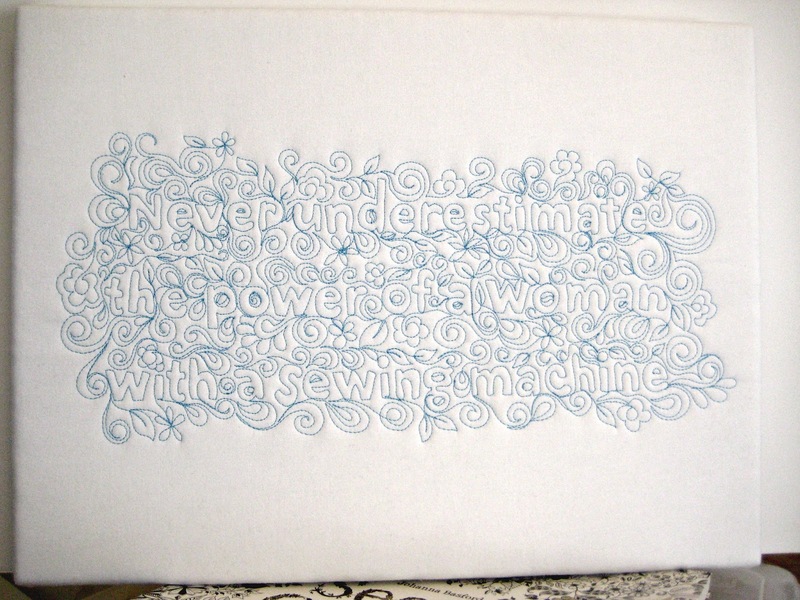 Working on a tutorial for incorporating text into a quilt project like I did with my "Never underestimate the power of a woman with a sewing machine" wall panel. I started sending my little guy to a 2 day a week preschool/daycare. My baby, my sweet little sunshine of a fella...sniff. OK, actually it's going quite well. He thinks it's fun and I don't have to scramble to find a babysitter when I work away from home. I think it's a nice preparation to get him ready for Kindergarten next year. I homeschooled my other two kids until this year when I sent them off to 3rd and 4th grade. 2014 has shaped up to be a year of changes for our family with hopes of additional changes in 2015. While I'm getting things done in my quilty work, my home life and all...you know the daily stuff....I'm feeling a bit stuck. So, so many projects to work on and ideas to pursue, but little focus. Have I told you all how much I love having this blogging space to share and teach? It makes my day when I put up a post and get such lovely comments from you. I think we get to encourage one another. Having something to share with you also helps me keep stitching away, even though it's a big time commitment to design, make, photograph, and write enough to have material to post. I get enough comments now that it's hard to respond to each one, but I read all of them and do my best to answer any that ask questions. As we head into the holiday shopping madness, might I suggest that you take a look at the businesses that advertise here on the blog? A purchase through these advertisers' links here helps keep this blog going. While I do use affiliate links in my posts from time to time when pointing out where you can buy some of the products I mention here on the blog, I never do 'sponsored posts' where a company would pay specifically for me to write about them. Don't forget to comment (or send an email) on my Playing with Color post to be entered in the Johanna Basford postcard giveaway before Monday. I hope you enjoyed my speed quilting video on Saturday. I finished up that project already, which is fast for me even if time lapse photography doesn't speed up reality. I shot another video as I worked on it some more, filling in the centers of some of the letters. 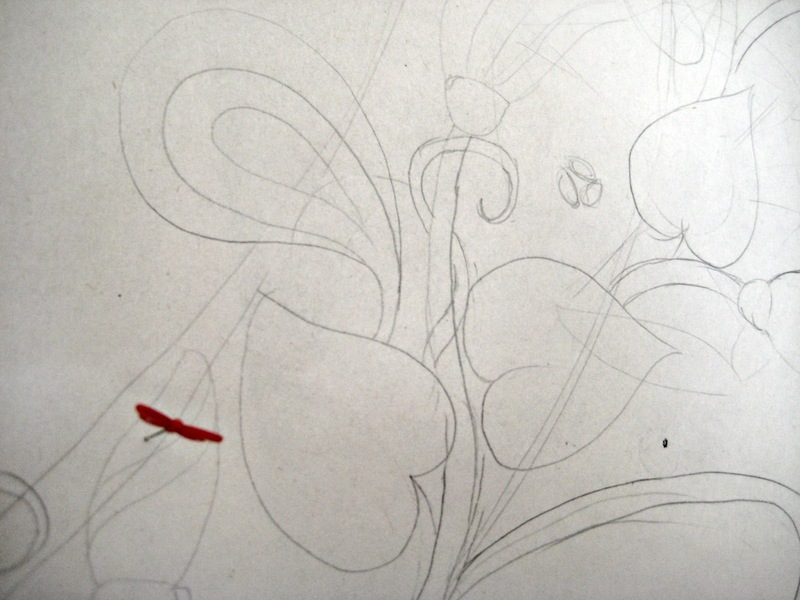 Then I filled in all around the quote with little swirls, shells, leaves, flowers and more. I started to quilt the surrounding area with some white Aurifil, but while the stitching looked great, it took away from the focus of the piece. So I had to do some frogging: rip it, rip it. Then I whipped out my staple gun and stapled it to an economy quality, 12x18 inch stretched canvas from AC Moore. I'll probably glue some ribbon over the stapled edge and down over the edge of the stretcher bars. I think it turned out great. I'll show you another picture of this piece on the wall when I show how I rearranged my studio next week. I love this quote! We've got our tools and we're not afraid to use them! Obscure factoid: I can also do a decent bit of welding. But this is so much prettier! I'll work up a little tutorial on how I get these letters to use for this and other projects in a few days or so. I'm really loving putting my work on canvas this way. No binding and fast! I love playing with color, don't you? To pull bits and pieces (and bolts) of color off my shelf or from a stack of fabric to see which colors look 'right' to me is one of the best things about quilting. If you follow my FaceBook page, you might have seen a status in which I was irritated with my computer monitor. That's because I ordered some wonderful new fabrics for a project inspired by my daughter's water color painting (blogged about in a post titled Design Time) and they were all wrong in person. They're perfectly lovely fabrics, mostly from Art Gallery Fabrics, which are so fine woven and smooth. But just not the right color for this project. The new fabrics are all on the left side, above. I pulled more fabric from my stash and began sorting, mixing and matching, adding and pulling fabrics as I went. Above is the semi-final selection. There's only one fabric from my recent purchase, the rest came from my stash! If it weren't for getting such yummy fabrics, I might have been frustrated. I'm still not sure about the greens. The bottom fabric is a natural linen that I will use as the background of the center medallion. I will probably have to find a few new fabrics or at least more of a few of the same colors as I definitely need enough for at least one more border. My daughter and I have been playing with color again, too. We went on a mother-daughter date to Barnes and Noble and Joanne Fabrics. She was so stinking excited! She even brought some of her own money so she could buy something of her own at Joanne's. We each got our own very cool coloring books at B&N. Each have some creative prompts in them. 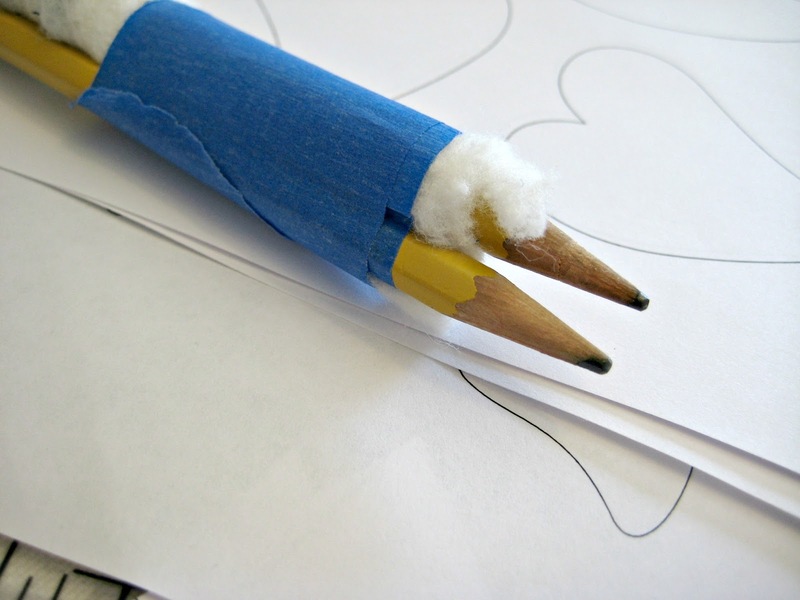 Hers has some great little drawing tips. Check out the page below in her book! Very Zentangle-esque. My book is my very own, long awaited copy of Johanna Basford's Secret Garden (Link goes to her book on Amazon). I've written about her blog before and the inspiration it gives me. Her drawings remind me of applique I'd like to do and the lines of her work inspire my free motion quilting too. It will take me a long time to finish up all the pages in this lovely coloring book. I am looking forward to coloring sessions spent with my girl. (A certain little kid 'helped' with one flower below.) I think coloring helps with learning what colors go together and how to make a pleasing combination from a limited range of colors. I used a combination of Derwent Inktense pencils and Prisma Color pencils for my coloring. I have to keep them sharpened well, as this book has very fine details. I wanted to use my neglected set of Gel pens, but they have been neglected so long that I can't find them. Isn't her work fabulous? See more on her blog, where she's celebrating the success of her book and showing off her best work yet- a new baby! She has this coloring book available in several languages and formats too . I see quilts on every page. I'd like to share some of her work with you too. I also bought a postcard version of Johanna's Secret Garden. To enter a drawing to win one colored postcard from me and a blank one to color yourself, leave me a comment below, making sure that you aren't a no-reply blogger (Google it if you're unsure what that means, comment on your own blog to see if you have become a no-reply blogger- Is your email associated with your emailed comment?) or make sure your email is in your comment. You may also email me privately to enter (my email is on the About Amy page). Since this is just 2 postcards, anyone on the planet can enter! But if I can't easily email you, I won't enter you. Sorry. Edited to add: The winner will be drawn next Monday, November 24th. I worked on a fast project today. I had started something like this a while back, but it was a bit messy. Today I started a new version. I shot a video while doing it too! I won't spoil the surprise by posting a still photo, so check out the video. Warning: If you get dizzy watching something really fast on video, wait a day or two and I'll post pics of the project! Whee! That was fun! I hope it brings a smile to your face, it sure made me laugh.